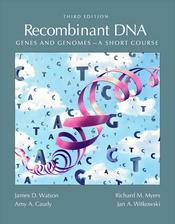 Recombinant DNA, Third Edition, is an essential text for undergraduate, graduate, and professional courses in Genomics, Cell and Molecular Biology, Recombinant DNA, Genetic Engineering, Human Genetics, Biotechnology, and Bioinformatics. The Third Edition of this landmark text offers an authoritative, accessible, and engaging introduction to modern, genome-centered biology from its foremost practitioners. The new edition explores core concepts in molecular biology in a contemporary inquiry-based context, building its coverage around the most relevant and exciting examples of current research and landmark experiments that redefined our understanding of DNA. As a result, students learn how working scientists make real high-impact discoveries. The first chapters provide an introduction to the fundamental concepts of genetics and genomics, an inside look at the Human Genome Project, bioinformatic and experimental techniques for large-scale genomic studies, and a survey of epigenetics and RNA interference. The final chapters cover the quest to identify disease-causing genes, the genetic basis of cancer, and DNA fingerprinting and forensics. In these chapters the authors provide examples of practical applications in human medicine, and discuss the future of human genetics and genomics projects.